This New and Improved GBC Catena 35 has a faster lamination speed by up to 3.5ft/min compared to the old model, and can now accommodate 2.25" core laminating films (with optional core adapter). With its small footprint, this new and improved laminator encapsulates and mounts jobs up to 12" wide without taking up much space in your office, school or small print shop. Plus, its increased 1/4" mounting gap ensures that mounting to foam core is quick and frustration-free. Equipped with new easy to use features including an open design, pivoting table, AutoSpeed and programmable presets, the NEW Catena 35 is now simpler than ever to operate - even for first-time users. Ideal in laminating signage, charts, graphs, photos, menus, placemats,certificates, and POP displays. This New GBC Catena 35 12" Roll Laminator tackles your most demanding jobs with unmatched ease, versatility and efficiency. Old model number: 1715830. AutoSpeed takes the guesswork out of laminating and ensures the best output every time. Pivoting table and heat shield provide easier access when changing film. AutoGrip aluminum, lightweight shafts make it simple to remove and add film. Pivoting table offers a place to rest heavy film rolls while inserting film on the shaft, simplifying the film prepping process. Redesigned easy-to-use control panel makes key buttons easier to find. Additional stop button on the back of the machine allows users to stop the machine while viewing output. Programmable preset keys store your most commonly used temperature settings. Compact footprint only requires a small amount of room when space is at a premium. Rear trimmer makes trimming after lamination hassle-free. Designed for thermal encapsulation and mounting applications. Mount to boards up to 1/4" thick. Optional rewind kit separates the release liner and enables the use of PSA films for cold applications. Adjustable temperature control up to 302F degrees. Variable laminating speeds from 1' – 8.5' per minute. Removable shaft hooks on the back of the machine extend the exit, reducing the likelihood of film wraps. Open design with improved rollers increase ease-ofuse while producing better quality output. The Catenas are uniquely designed, versatile color finishing systems which allow you to create an endless variety of graphic applications from your digital color output. Each machine in the Catena series is designed to work hand-in-hand with digital color output, delivering an affordable and accessible option in laminating, encapsulating and mounting exciting presentation graphics on demand. While the applications of the Catena can be quite sophisticated, the operation can be done simply and safely, even in the smallest office. The magnetically latched safety shield allows for easy removal and replacing when changing film and the user friendly control panel allows the operator to adjust heat and speeds for different thicknesses of paper, films and mounting substrates. 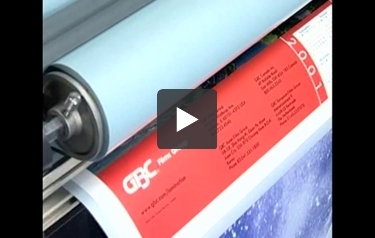 GBC is the name known throughout the printing and on-demand industry for quality laminating and finishing films. The Catena machines are designed to take advantage of thermal films and pressure-sensitive films such as GBC's Octiva, Octiva Lo-Melt and Arctic over-laminates and mounting adhesives as well as a variety of textured vinyl films and mounting boards. The Catena's thermal films range from 1 mil to 10 mil thick. Hi-Tac films are specially engineered to adhere to toners with high fuser oil content. The Catena 65 and 105 machines will also accommodate wax-based and heat-sensitive materials, utilizing our pressure-sensitive cold-laminating film. GBC has been leading technological advances in lamination for more than 30 years, so you know your investment will be supported with unbeatable service, the world's largest inventory of in-stock thermal films and innovative features like GBC's infrared heated roller design which distributes heat evenly and quickly across the heat rollers for perfect, scratch-free lamination. So advanced, infrared heat sensors instantly sense heat variation on the rollers and control the heat on/off process and the silicone rubber heat rollers reduce adhesive buildup and cleaning time and provide for a clean, scratch-less edge seal. The Catenas can mount images to a variety of materials. Adjustable roller pressure adjusts easily to accommodate mounting materials up to 3/16 of an inch thick. GBC has designed the Catena to meet your specific finishing needs. Images up to 12 inches wide can be finished on the Catena 35. The Catena 65 can finish output up to 25 inches wide and for wide-format images, the Catena 105 can mount and laminate images up to 40 inches wide. From small point of purchase displays to wide images, the Catenas can mount and finish it all. A good roll laminator can offer you a way to create professional-looking documents without a lot of effort. With these devices, you can create signs, posters, trade show graphics, and other large items. You can also laminate smaller documents. One of the best roll laminators available is the GBC Catena 35. It does have a few minor weaknesses, but they're not too bad. Therefore, let's see what strengths the Catena 35 has to offer, as well as consider its weaknesses. This is one of GBC's smaller roll laminators and this is reflected in its laminating width. The largest document you can process with it can be up to 12 inches wide. The Catena 35 is a great if you want to process your documents quickly. It has variable speeds and is capable of processing between 1.5 and 5 feet of material per minute. This machine would be perfect for large items such as posters and banners. With this machine, you can use varying thicknesses of laminating film from 3 to 10 mil. The 10 mil film is perfect if you'll be creating graphics and signage that will be placed outside or will be handled a fair bit. If you've ever wanted to work with mounting boards, you can do so with the Catena 35. It can accommodate boards that are up to 3/16” thick. There are adjustment handles that allow you to tweak the gap between the rollers, allowing you to process the boards. The Catena 35 is pretty easy to operate. It has an LCD display right up front so you can keep tracks of the machine's status (temperature, speed, ready status, etc.). There are even preset settings so you don't have to mess around with the machine if you don't want to. This laminator has silicone rollers and the heating element is made up out of an infrared coil which ensures the heat will be distributed evenly. There's also a cooling fan that not only cools down the machine, it helps your work remain smooth. This means everything you laminate will look fantastic. You can only use laminating film that has a 1” core. Rolls with larger cores are not compatible with this device. Since this is a roll laminator it will take up a fair amount of space. This particular unit's dimensions are 25” (width) x 13” (height) x 18” (depth). It will take up a fair amount of room on your work surface. Also, this machine weighs 55 pounds, so moving it might be challenging. The Catena 35 takes up to 10 minutes to warm up. This is a pretty long warm-up time for any laminator. Sure, the GBC Catena 35 has a few weaknesses, but overall, you couldn't do much better when shopping for a roll laminator. Everything you laminate will look great, the machine is easy to operate, and you get the results you want in very little time. So if you need a high-quality roll laminator, look no further than the Catena 35. Hi! Do you know if this machine would work for foil-laminating? I'm looking for a machine that allows me to dial in heat, speed & pressure manually (instead of just having preset options). Do you have any display models available or discounts? Thank you! Thank you for your question. The GBC Catena 35 12" Roll Laminator would not work for foil lamination. The process is different when using Lamination Foil vs standard roll laminate. For foil lamination you would need either a pouch laminator that gets hot enough to process 10 mil pouches ( there are several that offer control of speed and temperature but not pressure) or a dedicated Foil Fuser.